The first Saturday of December is a big day in the life of First Congregational. 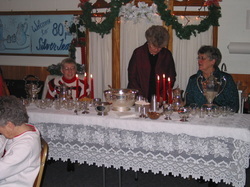 The ladies prepare and plan for an afternoon of tea, finger sandwiches and holiday baked goods. There is often a bake sale to accompany the tea. It has become a tradition for many people - men and women - to begin the holiday season. It is rumored that the event was a response to those who went out hunting in the late fall.